I was watching a card on eBay and did not happen to be home when the auction ended. Didn't make me too happy because I wanted this card. Thought the condition and price was right. Well, fortunate for me, the auction ended with no bids, and the seller put the card right back up. 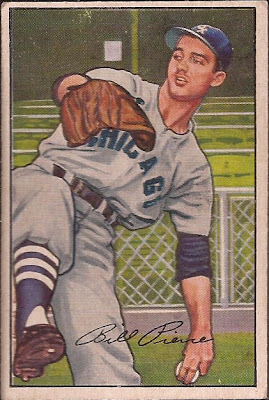 For $5 w/ shipping, I have now scratched another card off my Billy Pierce Project. Centering is a little off. The surface has a minor scratches, but you have to tilt it in the light to see that. A couple corners have dings, but I think I got a steal on the card. 1952 Bowman - DONE! That, my friend, is a nice card.